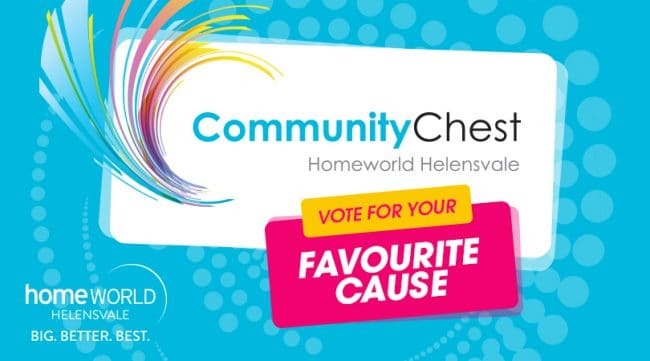 Homeworld Helensvale’s Community Chest program provides $14,000 in funding annually to local events, schools, charities, not for profit organisations and sporting clubs to help make the Gold Coast a better place to live, learn, work and play. The following organisations have been successful under Round 2 of the program and will now share in $7,000 in funding to benefit their organisations. Voting is now underway to decide how the $7,000 will be dispersed between the recipients. To cast your vote, click here. Baby Give Back is a Gold Coast charity that believes every baby deserves an equal start. The organisation accepts donations of new and used baby essentials to rehome with families living in crisis. To date, they’ve partnered with 49 local welfare agencies and charities to deliver cots, prams, car seats, clothes and other baby necessities to 1,149 families suffering from poverty, domestic violence, homelessness and other hardships. Community Chest funds will be used for purchasing new cots. The Hawks Cricket Club has grown to over 200 playing members from junior boys and girls through to senior cricketers and over 40s. As a local grassroots club, the Hawks help young players to not only learn the skills of cricket but more importantly, how to perform within a team, learn about sportsmanship, communicate and have fun in a safe, team environment. We are currently fundraising for new sporting equipment for our junior teams, including bats, pads, gloves, stumps and portable scoreboards. Scouting is about building confidence and self-esteem, learning important life and leadership skills, team building, education and fun! Scouts learn how to make good choices and take responsibility for their actions so that they are prepared for their adult life. The Helensvale Scouts are currently fundraising for replacement camping gear. The Movement Gold Coast is a not for profit organisation established to assist the less fortunate. The charity offers assistance with bread, food hampers, clothing, toiletries, household items and furniture. They also provide a weekly street feed in Labrador and a homeless outreach twice a week in Labrador, Southport and Surfers Paradise where they distribute hot meals, toiletries and blankets. The Movement Gold Coast is currently fundraising to purchase a van to assist with the collection anddistribution of food to families that need it the most. PreviousPrevious post:New Retailers At Homeworld HelensvaleNextNext post:Hello Summer!